It’s time for her to make her magic on the beach! In the Speedo Fairy Toddler Girls’ Short Sleeve Sun Top in Fairy, Penelope, and Watermelon, your little swimmer will be flying through the water like a dream. This picture perfect purple top features a watermelon accent collar and magnolia white accent sleeves with a fantastical fairy floating over the front to cast a spell on every little girl! The most distributed swimwear brand in the world, Speedo is sold in more than 170 countries around the globe. With adorable and tough looks like the Speedo Fairy Toddler Girls’ Short Sleeve Sun Top in Fairy, Penelope, and Watermelon made with top grade chlorine resistant Endurance+ fabric, it’s easy to see why Speedo is ultra popular! 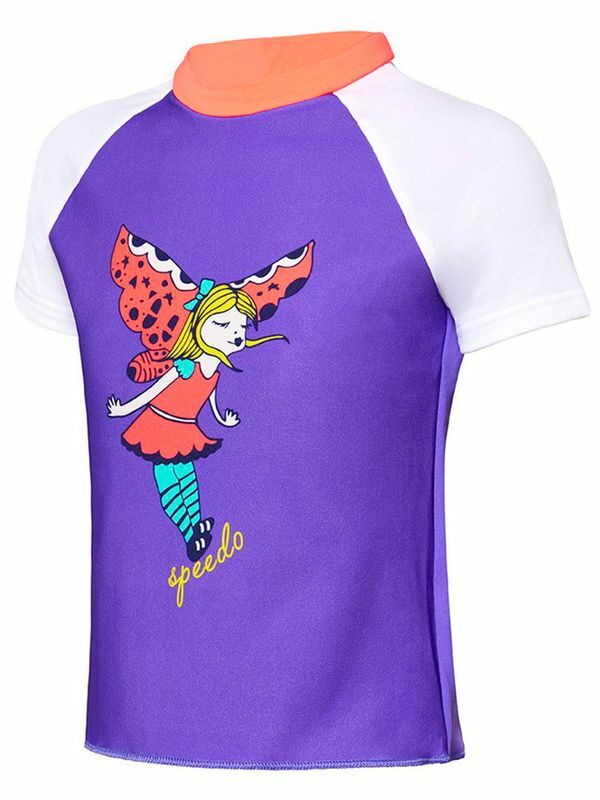 Fairy Toddler Girls Sun Top manufactured by Speedo Swimwear the worlds leading swimwear brand. Speedo is passionate about life in and around the water, creating revolutionary new technologies, designs and innovations.